Hi lovelies! 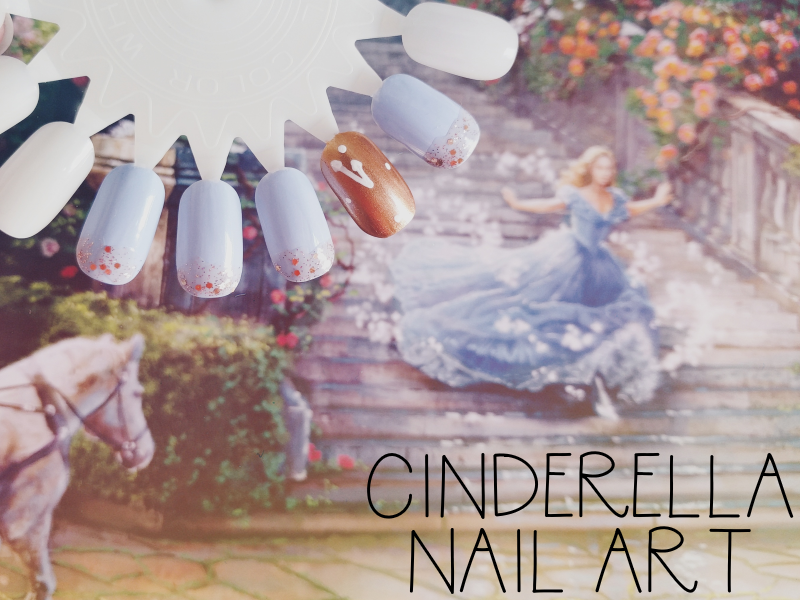 For this month's Disney nail art collab with the oh-so-talented Sam from The Belle Jar, the theme is the 2015 live action Cinderella! I'm a huge fan of this film, I even named this blog after it, so of course I had to ask Sam if I could do Ella for this collab! I mostly associate blue and gold with Ella - the blue from her dress and the gold of the butterflies on her glass slippers - so to represent her beautiful blue ball dress I use Essie's Bikini So Teeny which has a small amount of fine glitter in it so it's the perfect Cinderella blue! For the ring finger I'd originally planned to do a little arrangement of butterflies but as it turns out, I can't draw butterflies at all... I know, I'm sure even kiddos who can barely grasp a pencil can draw a butterfly but no matter what I tried, mine always came out looking like misshapen flowers! What a pro. So, changing tactics, I deiced to try to represent the famous Cinderella Midnight countdown by painting on a simple little clock face with a Barry M white nail art pen. 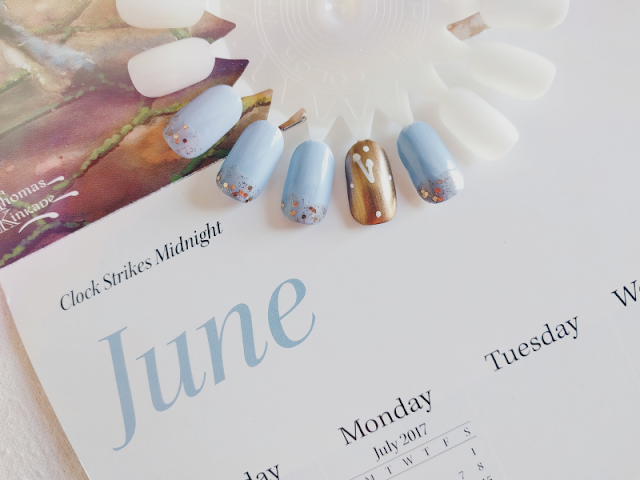 For the gold details I used Nature Republic's #48 nail polish for the background of the clock face and a glitter polish from Studio London for the sparkly tips. I was worried about this look from start to end but now I've seen how they look finished I'm actually pretty pleased with how they turned out! See you next months for our next collab! "Where there in kindness, there is goodness. Where there is goodness, there is magic."